I was all set and ready to go Oracle OpenWorld this year when things took a turn for the worse and it looked very much as if I wouldn’t be able to make it but things have thankfully changed yet again and it now looks like I will finally be able to make it to OOW this year after all. I would like to sincerely thank all of you who voted. Hopefully you can now make it to the session and maybe even pick up a thing or two. The Oracle Unconference is always one those secret little highlights of the whole Oracle OpenWorld event where you often get the opportunity to listen, meet and speak with some great speakers in relatively quiet and intimate (for OOW) surroundings. Always worth checking out the agenda each day. Now I’ve posted all this, my plans are now very likely to change yet again but hopefully I’ll get the opportunity to catchup with a whole bunch of you again at OOW 2010 in September. If you see me wondering around, don’t forget to say Gidday !! UPDATE: The Schedule Builder is now available from the Oracle OpenWorld website so those attending can now book and reserve places at their presentations of interest. I’ve got in early and booked all my favourites. Posted by Richard Foote in InSync10, Richard's Musings, World Cup. Well after a month of watching the World Cup during these long cold Canberra nights, my beloved Spain have finally, at long long last, after years and years of bitter disappointment and despair, have deservedly won the World Cup !! Iniesta, you legend, you will never have to buy a drink ever again, whenever or wherever you walk into any bar in Spain !! My dream now is for Australia to both host the World Cup in 2022 and to win it one day as well. 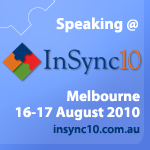 For those of you in Australia, just a reminder that the InSync10 Conference in Melbourne is fast approaching. I’ll be both attending and presenting this year and will be joined by a host of great speakers including Tom Kyte, Mogens Norgaard, Debra Lilley, Steven Feurestein, Connor McDonald, Kyle Hailey, Guy Harrison and Penny Cookson to name but a few. Should be a great event and I strongly recommend making it to Melbourne if you can. My session on “Indexing New Features in 11g R1 & R2” is in Room 106 on Tuesday, 17 August 10:00am-10:45am. I’ll soon be posting a series on Index Block Dumps, discussing how to read and interpret them and how they can be incredible useful in learning not only how Oracle indexes actually work and behave but also the internals to many core Oracle concepts such as row level locking, concurrency and read consistency.